The next available training is December 18, 2018 1pm – 5pm. This will be the safeTALK training located at Family Resource Center. 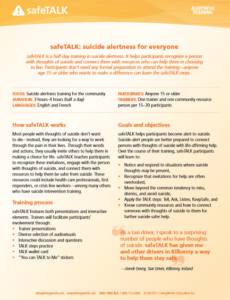 SafeTALK is a half-day training in suicide alertness. It helps participants recognize a person with thoughts of suicide and connect them with resources who can help them in choosing to live. Participants don’t need any formal preparation to attend the training – anyone age 15 or older who wants to make a difference can learn the safeTALK steps. Click on the picture or follow the link here to learn more about safeTALK. Follow the link here to see the 2018 schedule of safeTALK and ASIST trainings. Click here to register for any of the workshops.